Replacement Acoustic Doors & Integral Holding Frames for the Energy Recovery Turbine Control Facility that supports Europe’s second largest blast furnace situated in the North East of England. To site survey, design, manufacture, deliver and install 8No.external door sets (up to 3m wide x 3m high) complete with integral holding frames, and the refurbishment of a further 10No. internal doors sets. 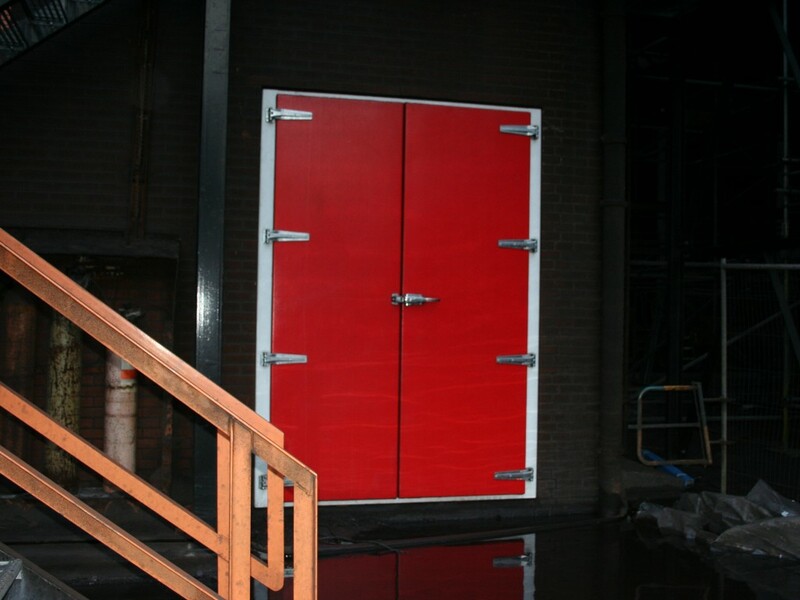 External & internal doorsets to be fit for purpose in reducing noise transmission, weatherproof and fire-rated where appropriate, whilst also providing gas containment or exclusion (hazardous gas area) thereby ensuring a safe working environment for operations & maintenance personnel. Frames & doors abrasive blast cleaned with chilled iron grit to Grade Sa2½ of BS EN ISO 8501-1 and finished in accordance with the customer’s specific two-pack epoxy paint system for maximum life expectancy when operating within a steel-making environment sited at a coastal location. Frames to be robust and securely fixed & sealed to brickwork using a weatherproof acoustic or intumescent mastic, to carry high specification acoustic doors. Door leaves fitted with a variety of heavy duty, corrosion resistant door furniture appropriate for each location (i.e. strap or cam-lift hinges, slamfast latches & strikes, door closers, shoot-bolts, emergency exit system having ‘break-glass’ bolt with ceramic tube & hammer etc.) with Georgian-wired fire-resistant vision panels where required. The assembled doorsets fitted with double-sealing acoustic, and 30 minute fire-rated intumescent seals, with particular attention to non-trip, flush thresholds. External single and double-leaf doorsets were rated Rw50dB & Rw46dB respectively, whilst internal doorsets ranged from Rw40dB to Rw50dB (i.e. equal to, or greater than the 'parent' wall structure) - bringing external noise levels back down to ambient noise levels, and internal noise levels commensurate with the activities undertaken in each room/environment, allowing personnel to effectively communicate inside and outside of the building. We are more than satisfied with the quality of the doors supplied and the way in which your staff conducted themselves when installing this equipment, especially when considering the less than ideal conditions in which they were expected to conduct their on-site activities.